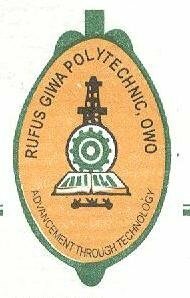 Rufus Giwa Polytechnic, Owo, RUGIPO Third [3rd] Batch Post-UTME Admission Screening Dates, Time and Venue for Full-Time National Diploma Students for 2018/2019 Academic Session. This is to inform the candidates that applied for admission into the ND (Full-Time) Programmes of Rufus Giwa Polytechnic, Owo but couldn't attend the 1st batch post-utme screening exercise are hereby informed to appear or present themselves in the upcoming 3rd batch screening exercise for 2018/2019 academic session. RUGIPO 3rd Batch POST UTME SCREENING EXAMS comes up on TUESDAY FEBRUARY 12, 2019 at 8:00am in the ICT Building. Kindly bring along with you while coming for the exam, the ORIGINAL COPIES of your JAMB Result and O' Level Results. NOTE: Sales of admission form is still ongoing click here to apply.